From the point of view of human history, the way in which the Thirteen States became independent is of far less importance than the fact that they did become independent. And with the establishment of their independence came a new sort of community into the world. It was like something coming out of an egg. It was a western European civilization that had broken free from the last traces of Empire and Christendom; it had not a vestige of monarchy left and no state religion. It had no dukes, princes, counts, nor any sort of title-bearers claiming to ascendancy or respect as a right. Even its unity was as yet a mere unity for defense and freedom. It was in these respects such, a clean start in political organization as the world had not seen before. The absence of any binding religious tie is especially noteworthy. It had a number of forms of Christianity, its spirit was indubitably Christian; but as a state document of 1796 explicitly declared, «The government of the United States is not in any sense founded on the Christian religion». The new community had in fact gone right down to the bare and stripped fundamentals of human association, and it was building up a new sort of society and a new sort of state upon those foundations. Here were about four million people scattered over vast areas with very slow and difficult means of intercommunication, poor as yet, but with the potentiality of limitless wealth, setting out to do in reality on a huge scale such a feat of, construction as the Athenian philosophers twenty-two centuries before had done in imagination and theory. This situation marks a definite stage in the release of man from precedent and usage, and a definite step forward towards the conscious and deliberate reconstruction of his circumstances to suit his needs and aims. It was a new method becoming practical in human affairs. The modern states of Europe have been evolved institution by institution slowly and planlessly out of preceding things. The United States were planned and made. In one respect, however, the creative freedom of the new nation was very seriously restricted. This new sort of community and state was not built upon a cleared site. It was not even so frankly an artificiality as some of the later Athenian colonies, which went out from the mother city to plan and build brand new city-states with brand new constitutions. 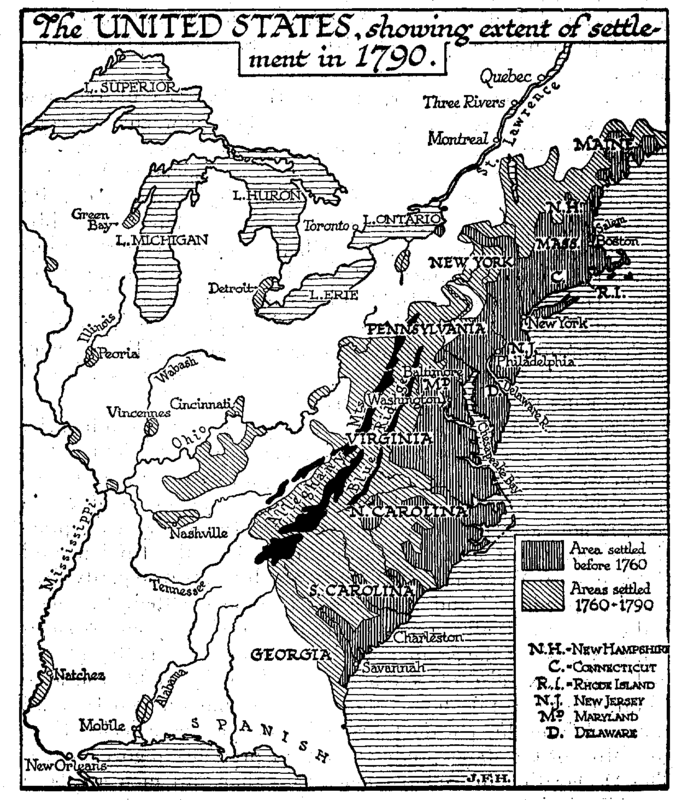 The thirteen colonies by the end of the war had all of them constitutions either like that of Connecticut and Rhode Island dating from their original charters (1662) or, as in the case of the rest of the states, where a British governor had played a large part in the administration, re-made during the conflict. But we may well consider these reconstructions as contributory essays and experiments in the general constructive effort. Upon the effort certain ideas stood out very prominently. One is the idea of political and social equality. This idea, which we saw coming into the world as an extreme and almost incredible idea in the age between Buddha and Jesus of Nazareth, is now asserted in the later eighteenth century as a practical standard of human relationship. Says the fundamental statement of Virginia: «All men are by nature equally free and independent», and it proceeds to rehearse their «rights», and to assert that all magistrates and governors are but «trustees and servants» of the commonweal. All men are equally entitled to the free exercise of religion. The king by right, the aristocrat, the «natural slave», the god king, and the god have all vanished from this political scheme so far as these declarations go. Most of the states produced similar preludes to government. The Declaration of Independence said that «all men are born equal». It is everywhere asserted in eighteenth-century terms that the new community is to be -to use the phraseology we have introduced in an earlier chapter-a community of will and not a community of obedience. But the thinkers of that time had a rather clumsier way of putting the thing, they imagined a sort of individual choice of and assent to citizenship that never in fact occurred-the so-called Social Contract. The Massachusetts preamble, for instance, asserts that the state is a voluntary association, «by, which the whole people covenants with each citizen and each citizen with the whole people that all shall be governed by certain laws for the common good». Now it will be evident that most of these fundamental statements are very questionable statements. Men are not born equal, they are not born free; they are born a most various multitude enmeshed in an ancient and complex social net. Nor, is any man invited to sign the social contract or failing that, to depart into solitude. These statements, literally interpreted, are so manifestly false that it is impossible to believe that the men who made them intended them to be literally interpreted. They made them in order to express certain elusive but profoundly important ideas -ideas that after another century and a half of thinking the world is in a better position to express. Civilization, as this outline has shown, arose as a community of obedience, and was essentially a community of obedience but generation after generation the spirit was abused by priests and rulers. There was a continual influx of masterful will from the forests, parklands, and steppes. The human spirit had at last rebelled altogether against the blind obedience’s of the common life; it was seeking -and at first it was seeking very clumsily- to achieve a new and better sort of civilization that should also be a community of will. To that end it was necessary that every man should be treated as the sovereign of himself; his standing was to be one of fellowship and not of servility. His real use, his, real importance depended upon his individual quality. The method by which these creators of political America sought to secure this community of will was an extremely simple and crude one. They gave what was for the time, and in view of American conditions, a very wide franchise. Conditions varied in the different states; the widest franchise was in Pennsylvania, where every adult male taxpayer voted, but, compared with Britain, all the United States were well within sight of manhood suffrage by the end of the eighteenth century. Those makers of America also, made efforts, considerable for their times, but puny by more modern standards, to secure a widely diffused common education. The information of the citizens as to what was going on at home and abroad, they left, apparently without any qualms of misgiving, to public meetings and the privately owned Printing press. The story of the various state constitutions, and of the constitution of the United States its a whole, is a very intricate one, and we can only deal with it here in the broadest way. The most noteworthy point in a, modern view is the disregard of women as citizens. The American community was a simple, largely agricultural community, and most women were married; it seemed natural that they should be represented by their men folk. But New Jersey admitted a few women to vote on it property qualification. Another point of great interest is the almost universal decision to have two governing assemblies, confirming or checking each other, on the model of the Lords and Commons of Britain. Only Pennsylvania had a single representative chamber, and that was felt to be a very dangerous and ultra-democratic state of affairs. Apart from the argument that legislation should be slow as well as sure, it is difficult to establish any necessity for this «bi-cameral» arrangement. It seems to have been a fashion with constitution planners in the eighteenth century rather than a reasonable imperative. The British division was an old one; the Lords, the original Parliament, was an assembly of «notables», the leading men of the kingdom; the House of Commons came in as a new factor, as the elected spokesmen of the burgbers and the small landed men. It was a little too hastily assumed in the eighteenth century that the commonalty would be given to wild impulses and would need checking; opinion was for democracy, but for democracy with powerful brakes always on, whether it was going up hill or down. About all the upper houses there was therefore a flavour of select ness; they were elected on a more limited franchise. This idea of making an upper chamber which shall be a stronghold for the substantial man does not appeal to modern thinkers so strongly as it did to the men of the eighteenth century, but the bi-cameral idea in another form still has its advocates. They suggest that a community may with advantage consider its affairs from two points of view through the eyes of a body elected to represent trades, industries, professions, public services, and the like, a body representing function, and through the eyes of a second body elected by localities to represent communities. For the members, of the former a man would vote by his calling, for the latter by his district of residence. They point out that the British House of Lords, is in effect a body representing function, in which the land, the law, and the church are no doubt disproportionately represented, but in which industrialism, finance, the great public services, art, science, and medicine, also find places; and that the British House of Commons is purely geographical in its reference. It has even been suggested in Britain that there should the «labour peers», selected from among the leaders of the great industrial trade unions. But these are speculations beyond our present scope. The Central Government of the United States was at first a very feeble body, a Congress of representatives of the thirteen governments, held together by certain Articles of Confederation. This Congress was little more than a conference of sovereign representatives; it had no control, for instance, over the foreign trade of each state, it could not coin money nor levy taxes by its own authority. When John Adams, the first minister from the United States to England, went to discuss a commercial treaty with the British foreign secretary, he was met by a request for thirteen representatives, one from each of the states concerned. He had to confess his inadequacy to make binding arrangements. The British presently began dealing with each state separately over the head of Congress, and they retained possession of a number of posts in the American territory about the great lakes because of the inability of Congress to bold these regions effectually. In another urgent matter Congress proved equally feeble. To the west of the thirteen states stretched limitless lands into which settlers were now pushing in ever increasing numbers. Each of the states had indefinable claims to expansion westward. It was evident to every clear-sighted man that the jostling of these claims must lead in the long run to war, unless the Central Government could take on their apportionment. The feebleness of the Central Government, its lack of concentration, became so much of an inconvenience and so manifest a danger that there was some secret discussion of a monarchy, and Nathaniel Gorham of Massachusetts, the president of Congress, caused Prince Henry of Prussia, the brother of Frederick the Great, to be approached on the subject. Finally a constitutional convention was called in 1787 at Philadelphia, and there it was that the present constitution of the United States was in its broad lines hammered out. A great change of spirit had gone on during the intervening years, a widespread realization of the need of unity. When the Articles of Confederation were drawn up, men had thought of the people of Virginia, the people of Massachusetts, the people of Rhode Island, and the like; but now there appears a new conception, «the people of the United States». The new government, with the executive President, the senators, congressmen, and the Supreme Court, that was now created, was declared to be the government of «the people of the United States»; it was a synthesis and not a mere assembly. It said «we the people», and not «we the states», as Lee of Virginia bitterly complained. It was to be a «federal» and not a confederate government. State by state the now constitution was ratified, and in the spring of 1788 the first congress upon the new lines assembled at New York, under the presidency of George Washington, who had been the national commander-in-chief throughout the War of Independence. The constitution then underwent considerable revision, and Washington upon the Potomac was selected as the Federal capital. 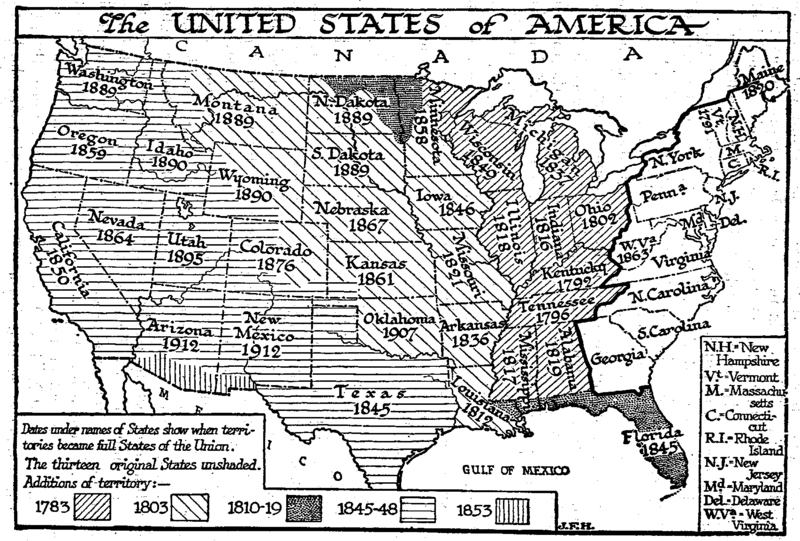 Dates under the names of states show when territories became full States of the Union. The Tripoli Treaty, see Channing, vol iii, chap xviii.